When you’re in the market for silver coins like the American Silver Eagle or the Canadian Maple Leaf, you will come across single coins as well as bulk coins packaged into tubes or boxes. Within the numismatic hobby, “mint tubes” refers to the plastic tube containing coins shipped from the mint. A “monster box” is a box holding multiple tubes of coins. It is important to note that these boxes and tubes don’t refer to just any tubes and boxes, but to the original packaging used by the mint to package newly-produced coins. Not all newly-minted collector coins come in these tubes or boxes, but many do. Coins are often packaged by the mint in a sealed plastic tube. Each tube usually holds between 10 and 25 coins, depending on the particular coin. For example, the 1oz Silver American Eagle made by the U.S. Mint comes packaged in 20-coin tubes. The Canadian Silver Leaf 1 ounce coin comes in a 25-coin tube. Each tube is specially designed to hold the exact size and quantity of coin specified. These tubes fit into a specially-designed “monster box,” so named because of the huge amount of silver contained in the relatively small box. Each box is usually designed to hold exactly 500 coins. 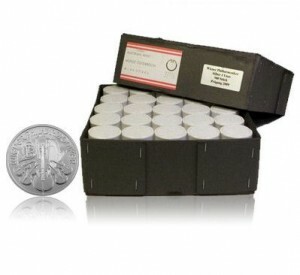 For example, a monster box of American Silver Eagle coins contains 25 tubes, each of which has 20 coins. A monster box is among the most compact forms of buying silver bullion; a box of 500 one-ounce coins contains more than 30 pounds of pure silver. Although some investors are hesitant about investing in such a large quantity of silver at one time, many realize the huge cost savings potential of buying by the box. Most investors find sealed tubes and monster boxes to be the most cost-effective way to invest in silver coins. Each tube or box contains a large quantity of coins. Frequently, buying in bulk means the best return on your investment. This is because coin dealers charge a per-coin premium over the spot price of silver. By buying in bulk, it is frequently possible to negotiate lower premiums, saving you money. If you’re looking to purchase silver coins as an investment, tubes and monster boxes are frequently the best option. Because the coins arrive from the mint sealed in tubes and boxes, this is a convenient way to purchase bulk silver. Plus, tubes and boxes are a compact, efficient way to store your precious metal investment over time. When the coin are kept in their original packaging, they are less likely to rub against each other, becoming scratched or damaged. The tubes and boxes protect your investment in the same condition in which it arrived from the mint. Both the tubes and boxes are tamper-evident, so you can be sure that if they’re still sealed, they contain exactly what they should. Anyone who breaks the seal on a tube or box is the first to handle the coins after they left the mint.